I have many easy cheese fondue recipes on my website; but that's not all. 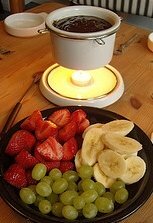 I also offer dessert fondue like chocolate fondue, caramel fondue, apricot and raspberry fondue further down the page. Soften the cream cheese an add to the sharp cheddar cheese; mix well. Add the seasonings, and then the crab and white wine. Combine thoroughly. Heat and serve in a fondue pot with the bread for dipping. 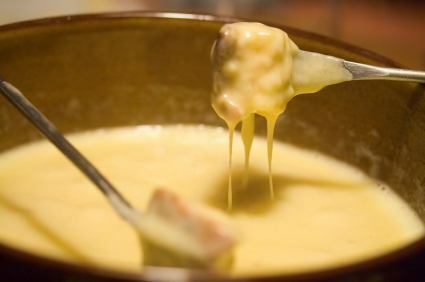 This is another awesome easy cheese fondue recipe. A must try. PREHEAT oven to 400 degrees and grease a medium casserole dish. Mix the ingredients thoroughly and pour into the prepared baking dish. Bake for 25-30 minutes or until starting to bubble along the sides. Place under the broiler to brown the top and serve with crackers, bread cubes or garlic bread. In a small bowl, stir the cornstarch and lemon juice together until smooth and set aside. In a saucepan set on medium heat - add the champagne and shallot and let simmer for 3 minutes. Remove from the heat and add the cheese and stir until combined. Next add the cornstarch mixture to the saucepan and return to medium heat. Stir constantly until the cheese is melted and creamy. Once it begins to boil and thickens, take off the heat and season with nutmeg and white pepper. Pour into a fondue pot and serve with bread chunks or whatever your little heart desires...Yum. I have this easy cheese fondue recipe on Christmas Eve and New Years. What a delight. Using the garlic peel, cut and rub the whole inside of your fondue pot. Add 1/2 of the white wine and the lemon juice. Heat until bubbly, then reduce the heat to low when you add 1/2 of the Gruyere and Swiss cheese. When this is melted and combined, add the remaining cheese and wine. In a small bowl, add the Kirsch to the cornstarch and mix until creamy. Slowly blend this into the cheese mixture. Cook, stirring constantly until thick and creamy. If it is too runny, add another teaspoon of cornstarch. Now add the nutmeg and paprika and serve with chunks of French bread, apples, sausage or vegetables. It is such an easy cheese fondue recipe. Dipping ideas: grilled steak, chicken, shrimp, mushrooms - or whatever you like. Add all ingredients together and simmer in your fondue pot for one hour. When you are ready to eat, bring the broth to a boil. Whisk ingredients together and serve with the fondue broth. Beat cream cheese and butter together until smooth. Add the remaining ingredients and mix well. Chill overnight for best flavor. Serve room temperature. Saute garlic and ginger in oil for 1 minute. Add soy sauce and sherry wine, and bring to a boil over medium heat. Combine the brown sugar and cornstarch, and stir into wine mixture. Heat and stir until thickened. May be served warm or at room temperature. PREHEAT the oven to 350 degrees and lightly spray a 9x13 pan with vegetable oil. In a saucepan, bring salted water to a boil and cook the broccoli for 3 minutes. Drain. In a small bowl - mix the flour, salt and pepper together. Wet the chicken pieces and coat with the flour mixture. In a heavy skillet, heat the butter and canola oil and fry the chicken until golden brown on each side. Arrange thighs in the prepared 9x13 pan. Place the broccoli over the chicken pieces and then layer with the crumbled bacon. In a saucepan over medium heat, melt the butter and stir in the flour, salt and nutmeg. Cook for 1 minute or until bubbly. Add the half-and-half and stir in the cheese. Stir constantly until cheese is melted and creamy. Pour evenly over the whole casserole and sprinkle with paprika. Bake for 30 minutes uncovered, or until bubbly. Now from easy cheese fondue recipes to my wonderful sweet fondue recipes. More than just easy cheese fondue recipes: How does chocolate fondue sound? If you have favorite brands of chocolate, please feel free to use them here. This recipe is very versatile, and forgiving. In a double boiler heat the milk, chocolate chips, marshmallow creme and heavy cream until it is melted. Whisk the fondue and fold in the vanilla extract. Pour into a fondue pot and serve with angel food or pound cake, slices of bananas, strawberries, apples, pineapple, graham crackers, lady fingers, etc. This is just awesome. You may also use a few tablespoons of Creme de Menthe, Grand Marnier or Kahlua instead of the Irish cream liqueur. Combine sugar and cocoa in a heavy saucepan. Pour in the water, sweetened condensed milk and half-and-half. Whisk well and add the butter. Cook over medium heat until it comes to a boil. Remove from heat and add the vanilla and Irish cream, mix well. Pour into a fondue pot. Dip with: angel food or pound cake, sugar cookies, pineapples, strawberries and banana chunks. In a double boiler, add the white chocolate and heavy cream; stirring until chocolate is melted and creamy. Pour into a fondue pot and use angel food or pound cake chunks, or sliced bananas, apples and strawberries. Assorted fruit for dipping, such as: apples, pineapple, banana, angel food cake, pound cake or whatever you like. Melt caramels in a double boiler, stirring frequently. Add the evaporated milk and marshmallows and stir until marshmallows melted. Transfer to a fondue pot for dipping. Toss the apples with lemon juice so they don't turn brown. Enjoy. Puree the apricots in a blender. In a saucepan, add the white sugar and cornstarch and mix well. Then add the heavy whipping cream and lemon juice. Stir constantly until thick and creamy. Transfer to a fondue pot and serve with torn angel food or pound cake and fruit. Terrific. Dip with: angel food or pound cake, banana and apple slices, strawberries or top homemade waffles and ice cream. In a saucepan, add the raspberries and jelly; bring to a boil. In a cup mix the cold water with the cornstarch and stir well. Add to the raspberry mixture. Bring to a boil, stirring constantly and cook for a minute or two. Strain and pour into a fondue pot. Enjoy.